2. Want to Have a Better Understanding of Your Horse? If you have ever worked with a horse with insulin resistance(IR) you know what a management nightmare this condition can be. Once a horse develops insulin resistance his diet has to be carefully controlled and his grazing time limited or completely prohibited. Chronic body soreness or even laminitis can make your horse’s life one of constant pain. If you don’t want your horse to face this you want to pay very close attention to the number 1 cause of insulin resistance. The number one cause of insulin resistance may not be what you think. Many people think the number one cause is excess fat but in my experience stress is a much more serious trigger to the development of IR. I have seen many horses that were obese but happy individuals and although the weight needed to come off they did not have IR. I have seen other horses with normal weight over much of their bodies but the telltale signs of IR in the form of heavy crests and fat pons over the shoulders and tail head. Chronic stress sets up a metabolic chain reaction in the horse’s body. The stress hormones trigger the release of sugar into the bloodstream and then insulin is released to move the glucose into the cells where it can be used as energy to escape the perceived threat. The problem occurs when there is no real threat. When the stress is chronic from emotional stress of confinement, training, showing or herd dynamics the excess glucose is not needed and it accumulates in the cells and tissues. The horse kicks into insulin resistance when the cells get full of unneeded glucose and say no to insulin and refuse to take in more glucose. The body then reacts by releasing more insulin but this does not result in any more uptake of glucose by the cells. Now glucose must be dumped into storage somewhere and fat is one of the tissues that is used which creates the hard, toxic fat deposits on the IR horse. Glucose can also be laid down in connective tissues which leads to overall body soreness and increased tendency to injury. To prevent IR you first must do everything you can to lower stress but completely eliminating it may not be possible. The temperament type of your horse will help determine how he deals with stress. Look at www.horsetemperament.com to check out formulas that address the nutrients needed by each type to deal with stress. If you don’t know your horse’s type you can get one of our typologists to help you type him. Since excess glucose is the ultimate enemy of the IR horse you can use diet to keep glucose levels lower. By feeding a low starch and sugar diet you create a state in the body where the cells and tissues are not always saturated with glucose. Keeping the cells a little hungry is a good thing so that when a stress reaction is triggered the cells can take in the excess glucose and utilize it. Another good way to control glucose is to exercise your horse regularly so he uses it for energy. Again, if your horse gets exercise the cells are hungry for glucose and will happily uptake extra released from a stress reaction. This is the reason you may not see IR in a working horse but it can come on with a vengeance when the horse is out of work for any reason. To deal with the number 1 cause of insulin resistance you must learn to recognize what causes stress for your horse. Knowing his temperament type can help you help him deal with stress. Feeding a diet that meets but does not exceed his energy needs is another way to help your horse say healthy but it won’t prevent IR. 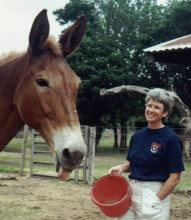 Unless otherwise attributed, all material is written and edited by Madalyn Ward, DVM. Copyright (c) 2015 HolisticHorsekeeping.com and Madalyn Ward, DVM. All rights reserved. This entry was posted in Illnesses & Disorders, Newsletters and tagged holistic horse care, holistic horse health, horse, horses, insulin-resistance, IR on November 1, 2015 by Madalyn Ward, DVM.